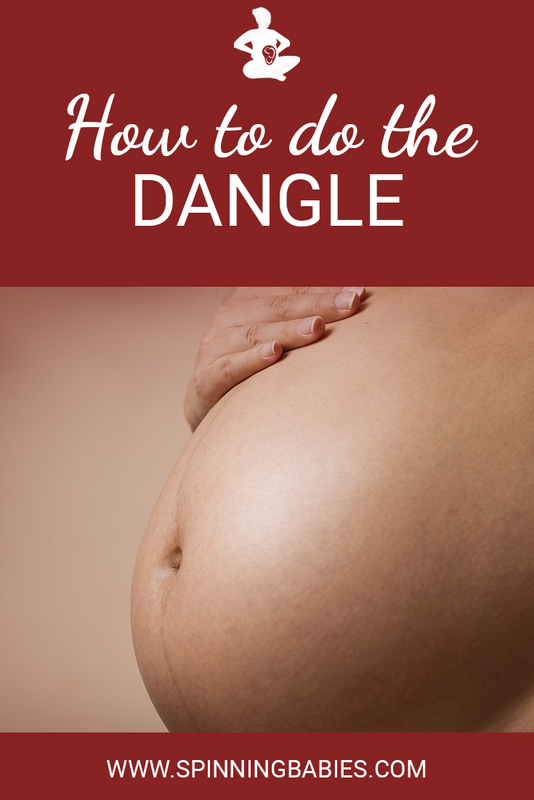 When contractions are strong and the baby needs more room to come down, the dangle can make all the difference. 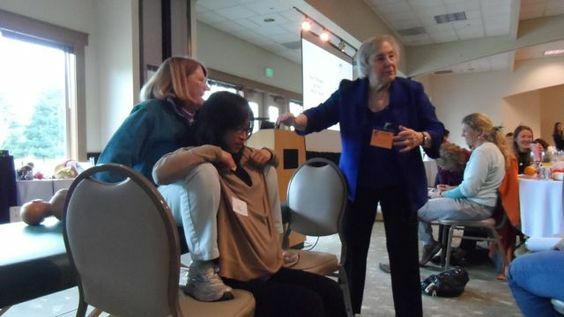 The Dangle was introduced to the modern birthing world by Penny Simkin, Physical Therapist, Doula Trainer and one of the founding members of DONA International. Penny calls this the “Baby, come out!” position. The Dangle uses the 3rd Principle of Spinning Babies: Movement. The dangle allows the mother’s hips and pelvis to hang freely during a contraction. It allows the best angle and the most mobility of the pelvis and can be done in a couple of ways in late labor. The dangle allows the pelvis full mobility during a contraction. Movement is brought on by the contraction, in this case, shifting the pelvis out of the way of the baby who is assumed to be in the center of the downward pressure of the contraction on the baby’s head. Do the Dangle after Balancing activities such as the Sidelying Release. When contractions are strong and descent is slow. Use when progress is slow and the mother is willing. We need the baby engaged for this to be appropriate. There are simpler techniques to try first, you wouldn’t likely begin with this one. Balance! Do some of the “releases” first, listed under Techniques. Next, if you’ve done the releases and then this without success, the provider may need to assist rotation in the baby who is low enough to be manually rotated. A birthing woman might also sit on her partner’s lap. Sometimes called a lap-squat. The mother can also hang from a rebozo scarf pulled over the bathroom door in her hospital birthing room. The mother’s back should be straight and her ribs lifted off her belly to make as much room as she can for baby. She must keep her hands near her armpits to prevent too much strain on the nerves running under her armpits. 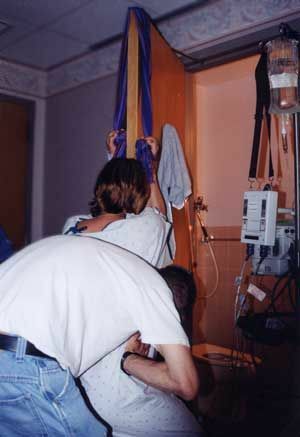 Another method is to use Penny Simkin’s Birthing Sling. OK, This mom had had a Cesarean with her first because the baby (~7 pounds) never got lower than -3 station even after hours of pushing. She really wanted to go non-medicated for this birth. They told her she had to be induced at 39 weeks. She finally explained to them she would not be induced before 42 weeks. Her first came the day after the due date. She started into labor on two different days. But, after several hours of working through contractions when she got really tired her body abruptly stopped contracting. She was having a good amount of bloody show but things just stopped. Once when I got there the baby looked REALLY low but about 5 hours later the baby moved back up high again. Finally, she thought her water may have broken up high and was leaking. After about 14 hours she when to the hospital to get checked. It turned out to be tons of mucus, not the bag of water, but she was contracting 4 minutes apart but they were very mild. She was 5cm and baby was floating and cervix was very posterior. They said go walk and come back in 45 minutes so we can monitor you. The doc that delivered her first was there and said you are not going to have any trouble dilating but you will have trouble pushing out the baby. Then she said you need to stay because you are a VBAC (Vaginal Birth After Cesarean) and this is not your first baby so you could deliver this baby at home or in the car on the way here….. This mom ate some lunch and went on a 2 hour power walk. She finally came back to my big van and sat on the ball in the a/c of the van to cool down and tried sucking her thumb to help bring on stronger contractions. We did all the acupressure points and it helped each time for the next contraction but that was all. Every time she would sit on the ball or sit down the contractions would space out and get weaker. Finally she went back up to tell them she just wanted to go home and wait for things to get going on their own. The doc didn’t like this but said lets check you again to make sure you aren’t going home at 9 cm and we don’t know it. Now she is a stretchy 6 cm, baby is now just bobbing and lower then floating (just a little but at least a small amount of change) but cervix is totally anterior. So she decided to stay and see what would happened. Finally she decided to let them do some pit but only a tiny amount to see how things go. Pit was started at 6 pm 6:45 she is now 7 cm 90% -3. Mom does belly lifting, walking, tall stretching but still is hardly feeling any pain. 7:30 pit turned up for the first time from 6 to 12. At 8 pm the new doc (chief of OB) that had been pressuring her to induce early was wonderful to work with in labor said she was willing to try longer to get things going but if she had to do a Cesarean she would rather do one at 9:30 PM while baby still looks OK and mom isn’t exhausted than to do one at 2:30 AM and baby is in distress and mom is totally worn out and the doc is tired. But she was very interested in all the things we were doing to get/keep things going. The doc wanted to break the water to see if that would help baby to drop farther. The baby was no longer bobbing but still at -3. I stepped out to take a small break and called Gail Tully from www.spinningbabies.com to see if she could think of something else I could do. Mom did great as long as she was standing upright and better when she stretched her arms over head but we weren’t really progressing. Gail said to try the rebozo over the bathroom door and do the dangle and do fast hip circles. [to tuck baby’s chin]. Mom was ready to let them break her water in 15 minutes. She was getting discouraged. The doc came in at 9:20 and broke her water, all clear. Baby is now 8 cm -2. In about 20 minutes transition really kicked in. Mom was now sitting in bed at a 45 degree recline for a little bit. Then we set her up straight. She had her knees wide and her feet together. Dad and I pushed on her knees really hard with each contraction, to help push the bottom of her pelvis together to give more room at the top. This mom had pushed for 2 1/2 hours for her first then had a Cesarean. She really didn’t believe this would happen. I told her baby was lower then her other baby had EVER been and I knew she could do it this time. I told her to do her “HOMEWORK”. She started pushing and dad and I now started pushing on the top of her pelvis to help open the bottom now. [Pelvic press] She started moving the baby right away. The mirror helped some but when she could touch the baby’s head she started crying with disbelief and joy and had the baby out in two more pushes!! She pushed for 36 minutes and delivered a beautiful baby girl 7 pounds 6.6 ounces!! It was awesome! The parents were beyond thrilled!! I love getting to help make a difference. Sorry this was so long, but I really needed to “de-brief”. BTW, the “homework” I give my moms is to practice the pushing; when she and her husband are “together” mom is to push him out. She gets immediate feedback from dad so she knows if she is doing it right. So far it has made a huge difference in the pushing time my moms have to push. OK, I feel better now, I have this all out of my brain and on paper now so I can move on to the next birth. Thanks, gals, for being there.